I like asparagus very much and it’s a really healthy vegetable (if you can stand the smell). 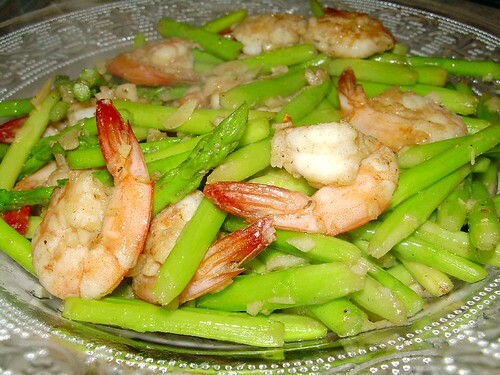 In chinese cooking, I think asparagus and prawns are like a match made in heaven. Some cooked them in belacan but I prefer mine simple with garlic. Less oily, I guess. These asparagus I bought from the supermarket are the local variety grown in Cameron Highlands. They are thinner in size compared to their Aussie or European counter-parts. As you prepare the asparagus spears, gently remove the thin layer of skin using your fingernails (wash your fingernails first, please – ahem!). It’s not easy but you’ll get the hang of it. You can skip this process but you may get too much stringy fibre between your teeth when you chew on them. LOL! Heat oil in wok on high heat. Saute garlic till beginning to brown. Add prawns and stir till begins to turn red. Add asparagus and seasoning. Stir well and add water. Cover lid for 30 seconds to a minute. Check to ensure that dish does not dry out. Add a little bit more water if it is dried out. Asparagus should be cooked in less than 2 minutes with just a little gravy to keep the dish moist. Nice template…you like wordpress? With blogger, might rank higher and faster because of Google’s ownership of Blogger? rasa malaysia : Yes, I think I like this template more than the previous one but there are lot of things to do to get more functions in order. I am not too sure about the blogger thing and whether it would rank higher if it is hosted by blogger. I shall have to rebuild PR from scratch. Asparagus is Ben’s favourite. I’m sure he will like this. Thank you for sharing. Neo : Ar? U are in Melbourne now? Nice recipe and great photo! Oh ya, asparagus goes really well with prawn.. simply delicious!